The story of the mind knows no end. Greek philosopher Aristotle spoke of telos, or the job for which something is particularly designed. The word telos may be understood as an end, aim, or purpose. An object's telos is described in relation to how it will benefit us in life, or ultimately, how it will benefit the soul. For example, a chair is made to be sat upon, and the ear's function is to hear. So it seems that the simple purpose of the mind may be to make sense of the world as we experience it. To tell the story of our life. My grandmother used to weave incredible tales of dragons and princesses and old gnomes on long journeys. "Tell me a story," I would say whenever she tucked me into bed. "Do you want a long story, or a short story?" she would ask. The question was a joke between us. I always wanted a long story. One thing my grandmother never asked, however, was whether I'd prefer a happy ending or a tragic one. It was a given that no matter how dire the imagined situation became, everything would be alright in the end. We enjoy fairy tales that end happily ever after. We look forward to victory. The hero slays a terrifying monster and the kingdom is his. The princess discovers hidden treasure and all of her dreams come true. Lover and beloved find each other again and live forever in love. All who hear such tales are inspired. Still, the stories we tell ourselves about the future often do not end well. The mind weaves a tale of distress or failure. We picture ourselves slain by the dragon, imprisoned by an old witch, or somehow abandoned. It's important to recognize that the tale we tell ourselves about the future arises from imagination. Our story may be enchanting and full of pathos. It may draw others close to us, for we project the need to be saved. Still, we can cut right through it. We need not be bound by the tale of distress that we have conjured up. Remember, the telos, or purpose, of mind is to benefit the soul. Mind might as well be put to the use of bringing the experience of joy and freedom. This is the teleion, or ultimate end, of all intermediate purpose. Happiness. As easy as it is to picture doom, we might purposefully imagine a brighter future. We can live as though things were going to work out just fine. In this way, we face temporary obstacles with confidence. We open to them as interesting learning experiences. We hone our skills. We grow with each challenge. Ultimately, we let go of storytelling altogether. Then, victory is ours. When we are released from our personal story, we experience the poignant beauty of life, just as it is. We live in the freedom of being absorbed into the wondrous whole that is without beginning or end. 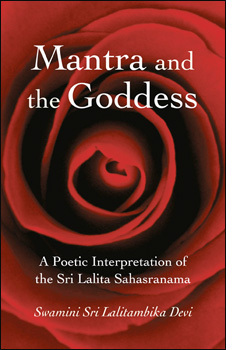 Mantra and the Goddess (Mantra Books).